From exceptionally rich and mostly well-preserved Lower Bajocian ammonite assemblages, eight lytoceratid species are described and discussed in detail. They belong to four genera (Lytoceras, Megalytoceras, Alocolytoceras and Nannolytoceras) and include some stratigraphically important forms. Thus the material yielded the hitherto known youngest (Lower Bajocian Otoites sauzei Zone) representative of genus Alocolytoceras (A. isztimeri n. sp.). On the basis of here-identified forms, the range of Lytoceras subfrancisci could be extended up into the Otoites sauzei Zone. A new species (Nannolytoceras gibbosum n. sp.) from the Witchellia laeviuscula/Otoites sauzei zonal boundary interval suggests that the origin of Nannolytoceras could have been earlier than previously recorded. The faunal compositions of the assemblages reflect a typical Tethyan character, with lytoceratids representing only the third most numerous ammonite group behind Phylloceratina and Ammonitina. Acht Lytoceraten-Arten einer besonders reichen und meist gut erhaltenen Ammoniten-Vergesellschaftung aus dem Unterbajocium werden eingehend beschrieben und ausführlich diskutiert. Sie gehören zu vier Gattungen (Lytoceras, Megalytoceras, Alocolytoceras und Nannolytoceras). 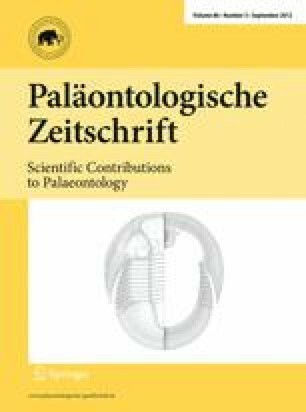 Die Assoziation enthält einige stratigraphisch wichtige Formen, darunter das bislang jüngste bekannte Vorkommen (Unterbajocium) der Gattung Alocolytoceras (A. isztimeri n. sp.). Aufgrund der hier beschriebenen Formen wird die stratigraphische Reichweite von Lytoceras subfrancisci bis in die Otoites sauzei Zone erweitert. Die neue Art (Nannolytoceras gibbosum n. sp.) aus dem Grenzintervall der Witchellia laeviscula/Otoites sauzei Zonen weist auf einen früheren Ursprung der Gattung Nannolytoceras hin als es bisher angenommen wurde. Die vorgestellte Faunenzusammensetzung weist einen typisch tethyalen Character, mit Lytoceraten als dritthäufigstes Element nach Phylloceraten und Ammonitiden, auf. We are indebted to Professor Barnabás Géczy and Dr. Zoltán Kovács for giving informations on literature and stratigraphic data, and to Prof. László Kordos of the Hungarian Geological Institute for making available specimens from the collections in his care for study and to figure. Viktória Baranyai helped with the German abstract. Dr. G. Schweigert (Stuttgart) and Dr. R. Hoffmann (Berlin), the referees of the manuscript, helped substantially to improve the final version of this paper. This is MTA-MTM Paleo contribution 144.